What we would do without tomatoes... Italy would starve, parents would have to cook instead of ordering out for pizza, and gardeners would be missing out on one of the most rewarding, easy to grow crops. Here is our guide to tomato basics. 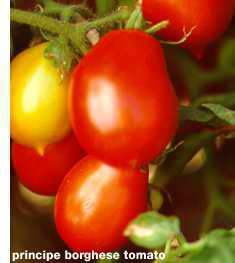 Tomatoes are generally broken down into two main classifications: determinate and indeterminate. Here's a quick rundown on their characteristics so that you can choose tomato varieties that meet your needs. Of course, if you're a true tomato lover, you'll include both kinds in your garden. Heirlooms tomatoes are gaining in popularity because many gardeners feel that these old-time varieties have more flavor than modern hybrids. They're also available in a wide choice of flavors, textures, shapes, and colors. If tomato diseases are common in your area you might consider growing hybrid varieties with bred-in disease resistance. These hybrid varieties often have a V, F, N, or T following their name. This means that the particular variety is resistant to either fusarium wilt (F), verticillium wilt (V), nematodes (N), or tobacco mosaic (T).